Home Family Health Flu Epidemic of 2018 – What’s New with Flu? Flu Epidemic of 2018 – What’s New with Flu? 2018 – the epic flu epidemic? The flu season is the worst in nearly a decade, according to the Centers for Disease Control (CDC). Forty-nine states have “widespread” flu activity. The flu got off to an early and severe start, with rates of hospitalizations and deaths from flu higher than usual for this time of year. Part of the reason is that the strain of flu that is predominant this year- Type A H3N2- tends to cause more severe symptoms. Also, development of an effective vaccine for H3N2 is more difficult because this strain often acquires genetic changes during production, reducing vaccine effectiveness. A flu epidemic occurs when flu activity is higher than usual. The normal level is defined by the CDC as the baseline value when the flu viruses aren’t widely spreading in people (usually from mid-May to September). In the USA, there is a seasonal flu epidemic almost every year at some point between October and mid-May. As bad as this flu epidemic seems, it is not as serious as a flu pandemic like the one that occurred exactly 100 years ago. A pandemic is a global outbreak of a completely new influenza A virus that spreads rapidly and in a sustained manner. Pandemics are rare (just three times in the 20th century). During the 1918 flu pandemic, people had little or no immunity to this new virus strain, there were no vaccines or antiviral medications, and many had no access to healthcare. The 1918 flu pandemic caused an estimated 675,000 deaths in the US. We are not experiencing a flu pandemic. Influenza (“the flu”) is a contagious illness affecting the respiratory tract. The most common flu viruses affecting people are influenza Types A and B. There are many different strains of both A and B viruses. Flu viruses are spread from one person to another mainly by droplets made when people with flu cough, sneeze or talk. These droplets can land in the mouths or noses of people who are nearby or possibly inhaled into the lungs. 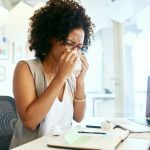 A new study has found clear evidence that flu patients also breathe the virus out through their mouths and noses, and that these virus particles can stay suspended in the air for perhaps hours- so you could get the flu from someone with flu just breathing on you. Less often, the flu may be spread by touching a contaminated surface. Generally, someone with flu can spread it to others starting one day before symptoms develop and up to 5 to 7 days after becoming sick. So you can spread the flu both before and after you actually feel sick! Flu symptoms often develop suddenly and may include fever, chills, cough, sore throat, runny/stuffy nose, muscle or body aches, headache and tiredness. Some people have vomiting and diarrhea, but this is more common in children. Flu is different than a cold. The flu and the common cold are both respiratory illnesses, but they are caused by different viruses. Because these two types of illnesses have similar symptoms, it can be difficult to tell the difference between them based on symptoms alone. 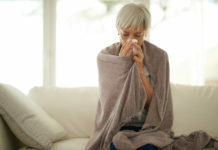 In general, the flu is worse than the common cold, and flu can cause more serious complications such as pneumonia and other bacterial infections. 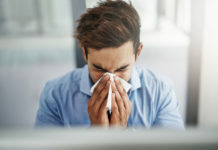 In addition to diagnosing flu based on symptoms and clinical judgment, your healthcare provider may choose to do a diagnostic test such as one using a sample from a nasal swab. How do I avoid the flu? Get the flu vaccine– recommended for those older than 6 months of age, every year. (If you have an allergy to eggs or any ingredients of the vaccine, have ever had an illness called Guillain- Barre Syndrome, or aren’t feeling well, talk to your doctor beforehand.) Even now, it isn’t too late- you can still get the vaccine and achieve some protection. Flu vaccines can reduce flu illnesses, doctor’s visits, missed work and school, and prevent flu-related hospitalizations. Flu vaccines cannot cause the flu. Prevent the spread of germs– Wash your hands often with soap and water. Try to avoid close contact with sick people- the CDC advises that flu droplets travel a distance of about 6 feet. Cover your mouth and nose with a tissue (or if no tissue, your sleeve) when you cough or sneeze. Avoid touching your eyes, nose and mouth because germs spread easily this way. Clean surfaces and objects that are likely to be contaminated with germs. Take antiviral medicines if your healthcare provider prescribes them. Antiviral medicines are different than antibiotics. If you get the flu, antiviral medicines can reduce the severity and duration of the flu, and help prevent complications of the flu. These antiviral drugs work best if taken within two days of getting sick but can be helpful if started later too. If you get very sick, are pregnant or are 65 years or older, or are at high risk for flu-related complications, call your doctor. You might need antiviral drugs to treat flu. Stay at home and rest. Avoid close contact with those who are well, so you won’t make them sick. Drink plenty of water and clear liquids to prevent fluid loss.